The fox is a totem that has touched almost every society on the planet. 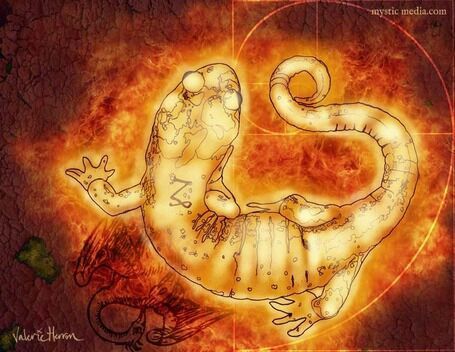 It is a totem that speaks of the need to develop or the awakening of camouflage, invisibility, and shapeshifting. 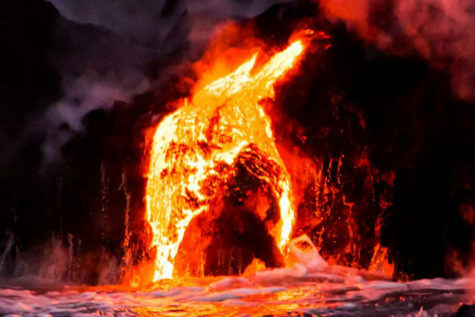 It is one of the most uniquely skilled and ingenious animals of nature. It can teach these skills to those whose life it enters. 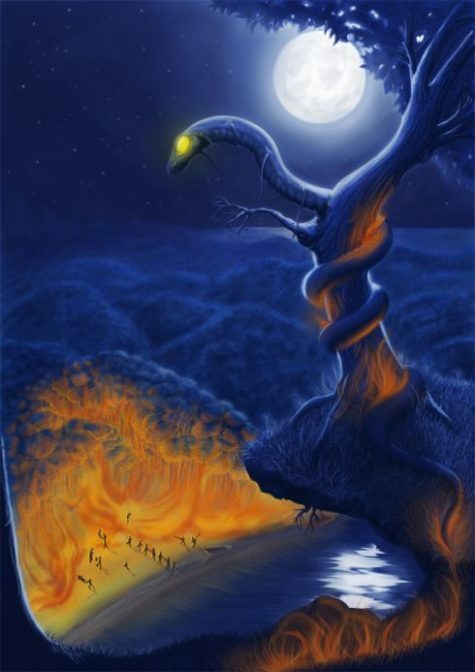 The fox has a long history of magick and cunning associated with it. 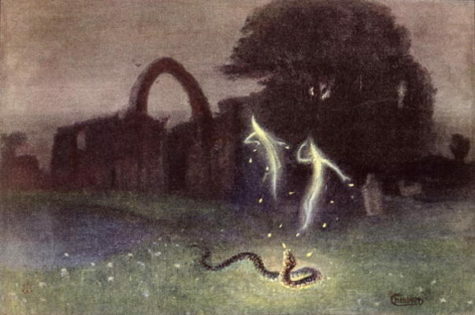 Because it is a creature of the night, it is often imbued with supernatural power. 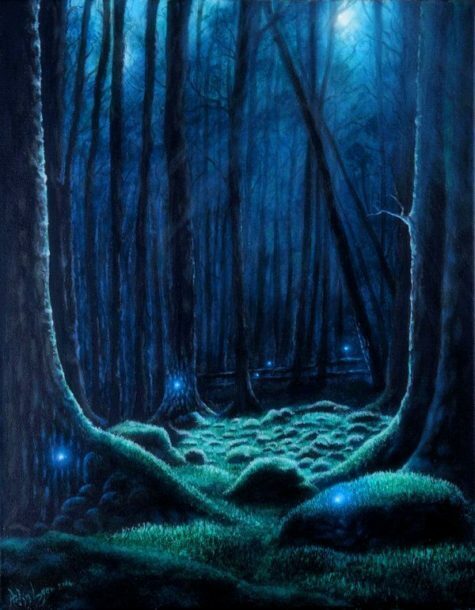 It is often most visible at the times of dawn and dusk, the “Between Times” when the magickal world and the world in which we live intersect. It lives at the edges of forests and open land – the border areas. 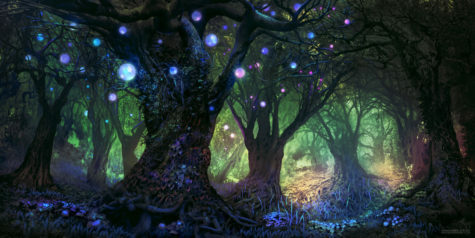 Because it is an animal of the “Between Times and Places,” it can be a guide to enter the Faerie Realm. 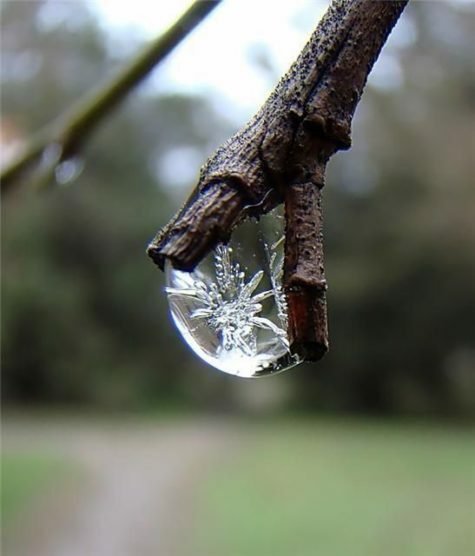 Its appearance at such times can often signal that the Faerie Realm is about to open for the individual. The fox encourages us to think outside of the box and use our intelligence in different, creative ways. 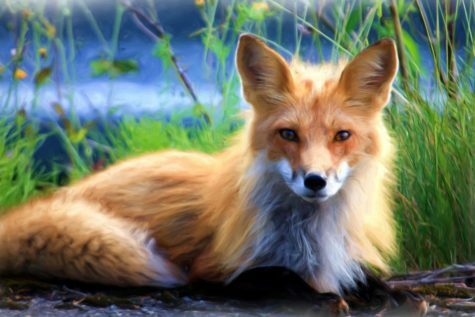 The fox also brings us a message to try to approach our circumstances differently that we normally would. Be aware of some of our habits, and try a different angle of action. The fox also a reminder that we must utilize all of our resources (seen and unseen) in order to accomplish our goals. Sometimes this means calling upon some unorthodox methods. Furthermore, the fox is a sign to be mindful of our surroundings. 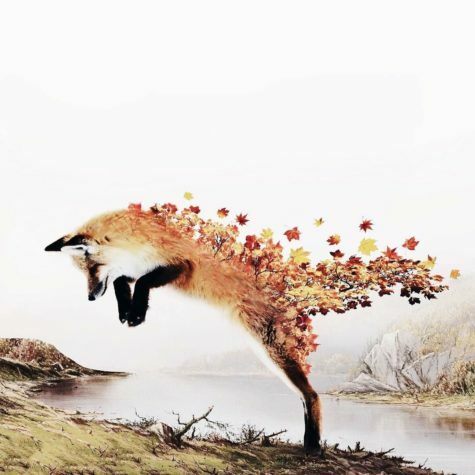 Phenomenally effective shape-shifters and incredibly adaptable, the fox beckons us to not make too many waves but rather, adapt to our surroundings, blend into it, and use our surroundings (and circumstances) to our advantage. 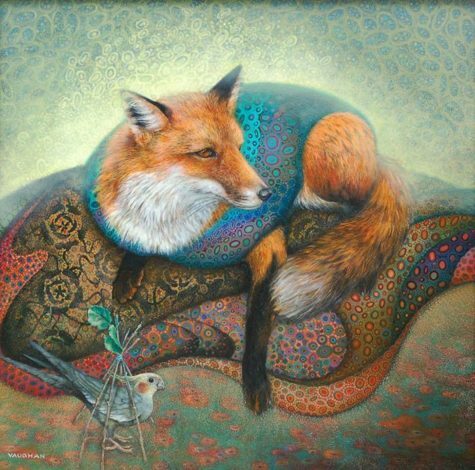 The fox has an incredible amount of knowledge and wisdom to share with us if/when we are willing to be still for the teachings. Spend some meditative time with the spirit of the fox – odds are you will be amazed at the powerful insight this regal creature has to offer you. 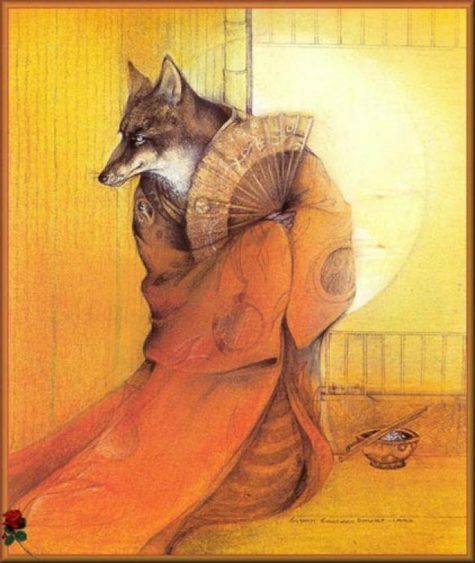 In the Orient, it was believed that foxes were capable of assuming human form. In ancient Chinese lore, the fox acquires the faculty to become human at the age of 50, and on its hundredth birthday, it becomes either a wizard or a beautiful maiden who will ultimately destroy any man unlucky enough to fall in love with her. In Japan, the fox is a particularly good influence. It is both a symbol of fertility and sacred to Inari, the God of Plenty. 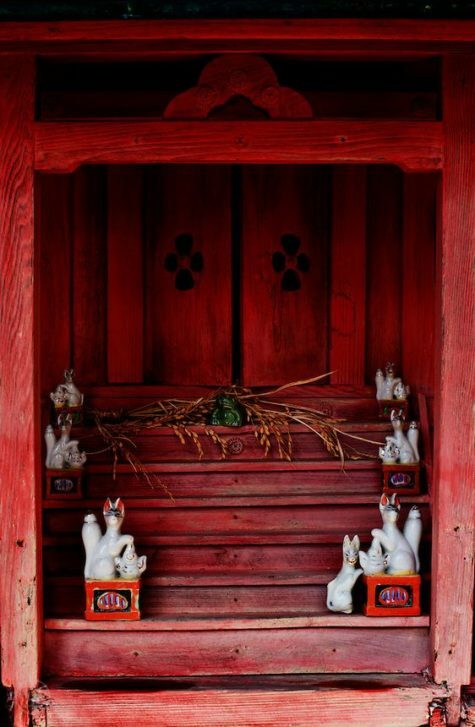 Inari often takes on the form of the fox, and shopkeepers, housekeepers, and businessmen of the Shinto faith keep a little shrine in their homes dedicated to this fox God, so that he will watch over their affairs. There are several American Indian tribes that tell tales of hunters who accidentally discovered their wives were foxes. 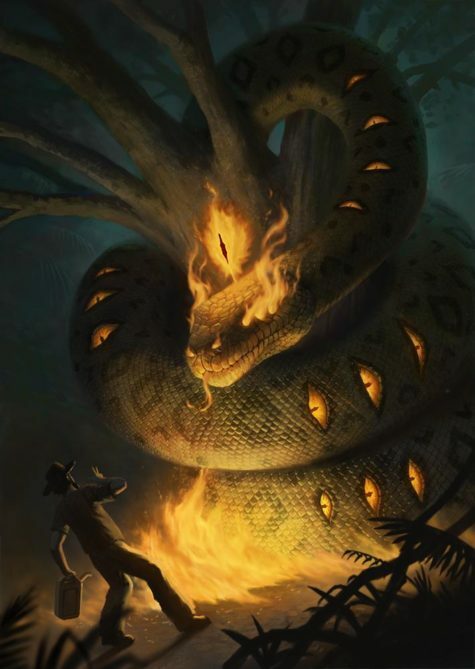 This is very symbolic of the idea of magick being born within the feminine energies, and that unless a male can recognize the magick of the feminine – in himself or others – and learn to use it to shapeshift his own life, it will ultimately lead to destruction. 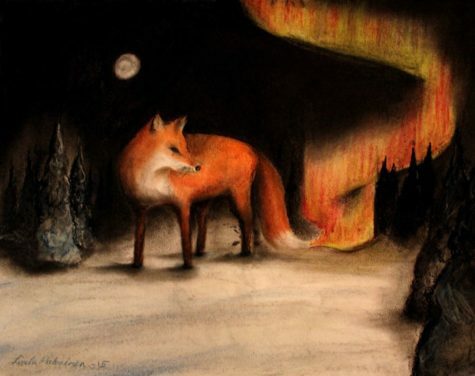 The Cherokees invoke fox medicine to prevent frostbite, and Hopi shamans always wear fox skins in their healing rites. The Choctaw saw fox as the protector of the family unity. Apaches credited fox with the killing of the evil bear, and for sticking its tail fur into the flame and stealing fire for humans. 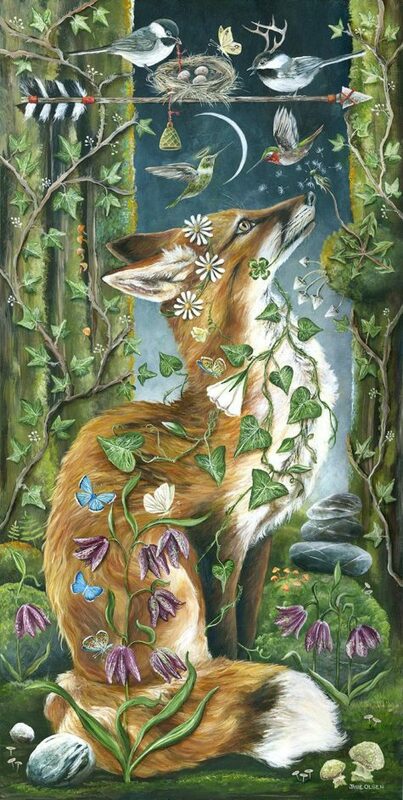 The Celts believed the fox to be a guide, and was honored for its wisdom. 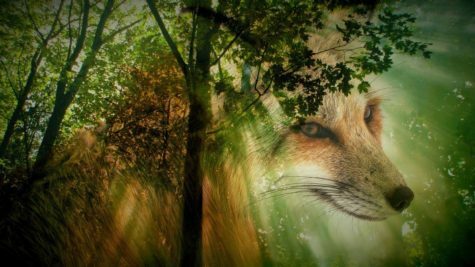 The Celts understood the fox knows the woods intimately, and they would rely upon the fox as their guide in the spirit world. In other societies, fox was also held in high esteem. In Persia it was sacred, for it helped the deceased get to heaven. In Egypt, fox fur was thought to bring favor with the gods. The Indians of Peru had a fox god. The fox was often believed to reward those who did it service.The fox is the totem animal of Dionysus, whose seductively foxy priestesses wore fox skins. Early Christians associated the fox with that most cunning of tricksters, the Devil. 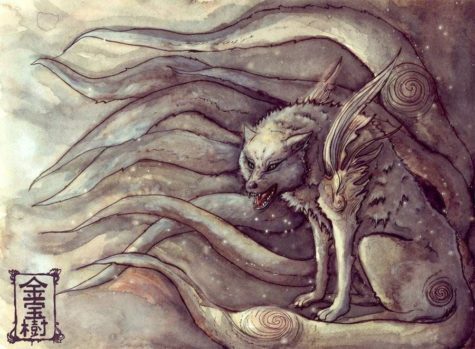 The Fox Spirit of Japan and Korea is a shapeshifting often evil spirit called a Kitsune. You can read more about Fox Spirits here. Playfulness, light-heartedness, glorious playful enthusiasm. It is noteworthy to observe the fox while it is on the hunt. We see its entire body is pointed like an arrow – straight and tightly aimed. This is a symbolic message for us to set a determined, and powerfully focused mindset in order to “hit the target” of our desires. 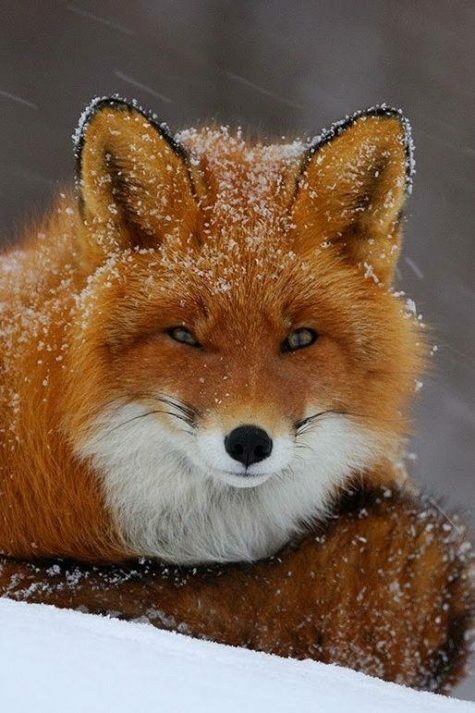 The Red Fox carries with it the symbolism and totem powers of passion and energy, in touch with the primordial Earth spirit, having confidence that the Earth supplies for all of it’s needs. The Gray Fox also known as the Silver Fox is a symbol of being debonair, svelte, and in good taste. His discreet manner is that of nobility and refinement. The fur of the Silver Fox is almost iridescent as it sparkles in the sun, capturing the essence of wealth and good fortune. The Arctic Fox is a sign of magick amidst the ordinary, capable of invisibility with the cloak of snow surrounding, it, magick is most definitely afoot when the Arctic Fox appears for you. 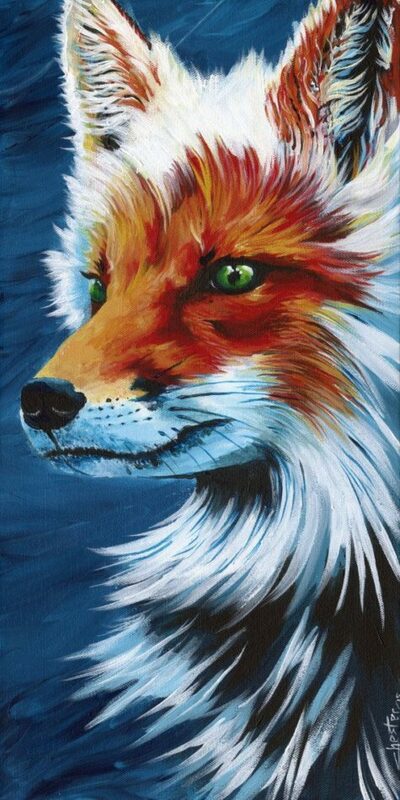 Being inspired by a fox totem, you can work at developing the sharpness of your mental skills: Analytical intelligence, power of deduction, observation can come into play more powerfully in how you deal with daily matters or bigger projects. The spirit of the fox may also imply that you are sharpening your physical alertness and responsiveness. The coat of the fox serves as camouflage, and most fox coats have variations of color within them. 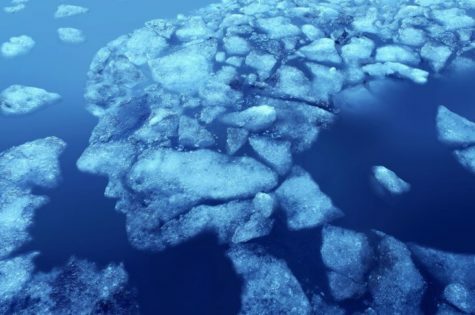 This facilitates their ability to stay camouflaged and remain relatively unseen. 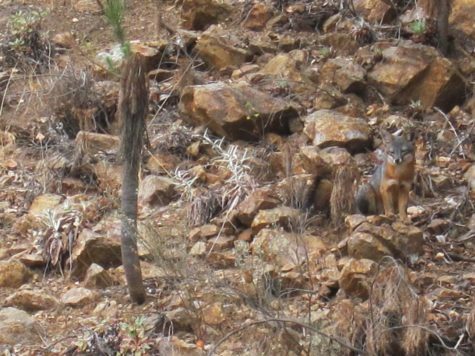 Practicing and using camouflage is something everyone with a fox totem should learn to do. Working to blend in with the surroundings, to come and go unnoticed, moving silently about without revealing your intentions is all part of what fox teaches. Much of this is reflected in learning to control the aura, the energy field around your body. You can adjust its frequency and intensity so that you harmonize more with others. You can focus on changing its appearance so that you blend in. Practice by standing against a wall and see yourself (and your aura) becoming the color of the wall, just as if you were fading into it. The next time you go to a party, take a seat in a chair or on a couch and see yourself as a fox that blends in perfectly to its surroundings. Remember that a fox is most often ween when it is out in the open, so visualize yourself as taking on the color and pattern of the chair. Then sit quietly and watch how many people, accidentally bump into you or even begin to sit on you because they did not “notice or see” you there. You will be amazed. Practice seeing yourself as a fox when you enter or leave a party or gathering. See yourself as blending into the gathering, melting into it. Do not be surprised as the night goes on when people make such comments as, “When did you arrive?” “How long have you been here?” “I didn’t see you come in,” or “When did you leaved?” The more you work with fox, the easier this becomes. The historical character of Merlin had to have used fox medicine and energy to accomplish much of what he did, but he practiced it. 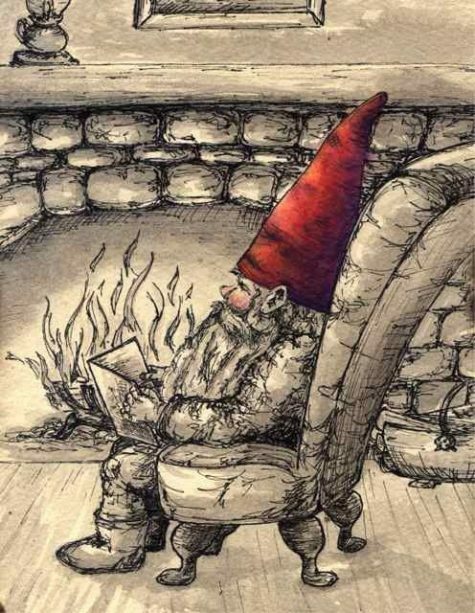 Even during his life time Merlin was largely unknown to the greater public, except as “Merlin.” When he was summoned by kings or needed desperately to recruit other allies, he came silently, disguised as a poor shepherd, as a woodcutter or as a peasant. Even the sovereigns failed to recognize his in his various disguises. He practiced concealment habitually and for a long period of time. For those with fox totems, it will be important to learn this art of camouflage, and its related arts of invisibility and shapeshifting. The fox uses its ability at quiet camouflage to its benefit. With practice you can develop this same kind of ability and apply it so that you may see and hear things you otherwise could not. Hair and fur are ancient symbols for energy and fertility, and layers of fur reflect levels of energy and levels of fertility. With the fox it is the undercoat which is the primal energy source from which an individual draws his or her abilities. The outer layer protects and defines how that energy is being used by the individual. 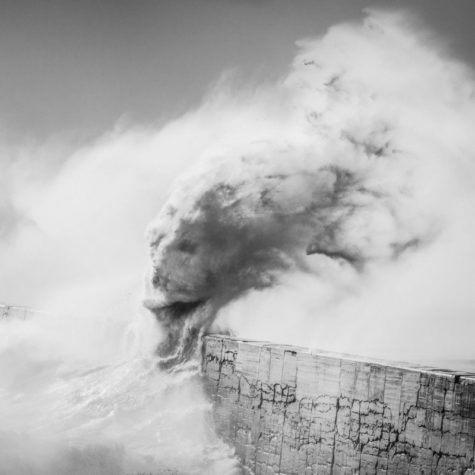 As the outer hair changes so does the expression of the inner creative force. Hair should become very important to an individual with a fox totem. 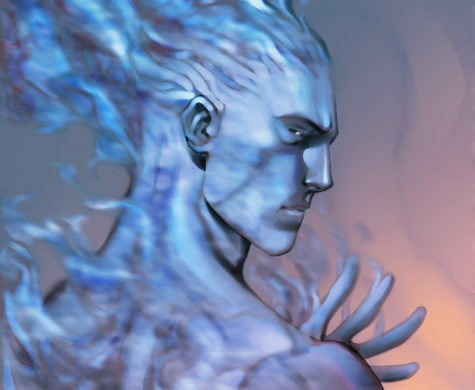 If a change is needed on certain levels, learning to change the hair to reflect the change desired helps to activate fox energy so that shapeshifting can begin. The overall thickness of the fur makes the fox look much larger than it really is. This is especially significant for those with fox totems. These individuals have the ability to make themselves appear larger than they actually are. Because of this, an individual schooled in working with this aspect of fox medicine can use it to his or her advantage, for personal protection or for making greater impressions in various areas of his or her life. The brush or tail has always been considered the most sacred part of the fox, although this is not necessarily true. It does hold great significance for one with a fox totem. When it runs, the fox tail is always in a horizontal position out from the body. This acts as a rudder. This horizontal position is the feminine form. 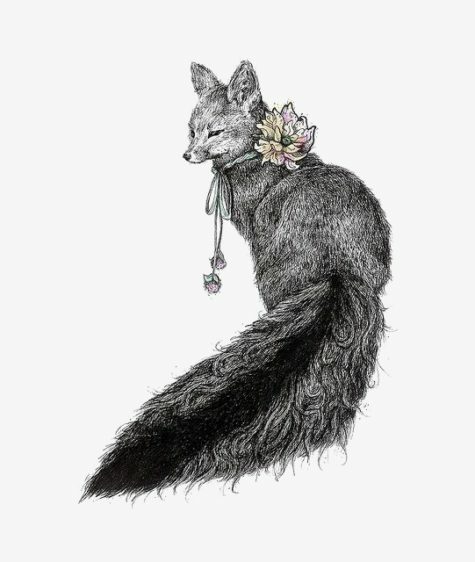 Thus the fox tail is a symbol of directly guiding the feminine creative forces. It is especially beneficial to the fox when making abrupt and sharp turns. 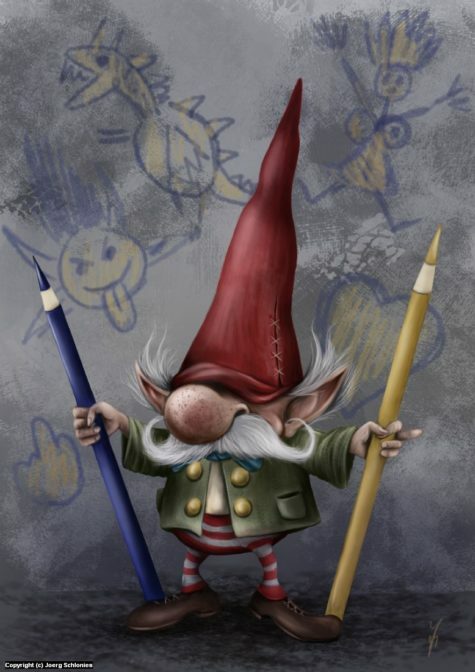 If the focus stays on the creative energies, any sharp turn in the individual’s life will be accomplished with ease. The tail also serves as insulation from the cold for the nose and feet, as the fox wraps itself up in its tail. 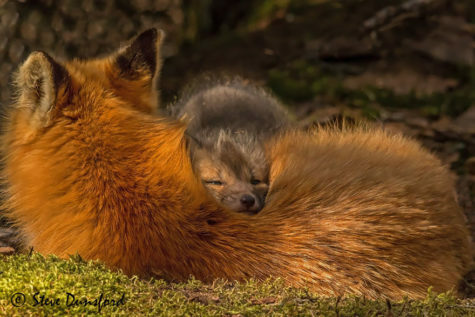 Individuals with fox totems have an ability to insulate themselves from anything that may seem to be cold, especially in relationships. They can become warm and cozy in themselves. Although a fox dislikes getting wet, it is an excellent swimmer. This is also very significant, for it says something about the innate character of those with a fox totem. 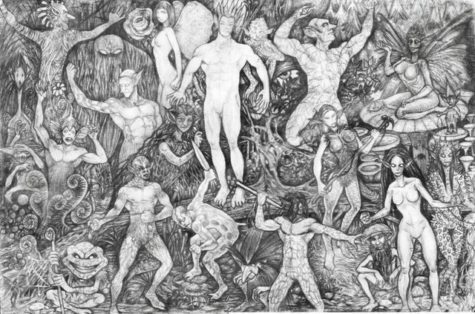 They have learned to draw upon and express the feminine energies, the creative force, in the outer world. 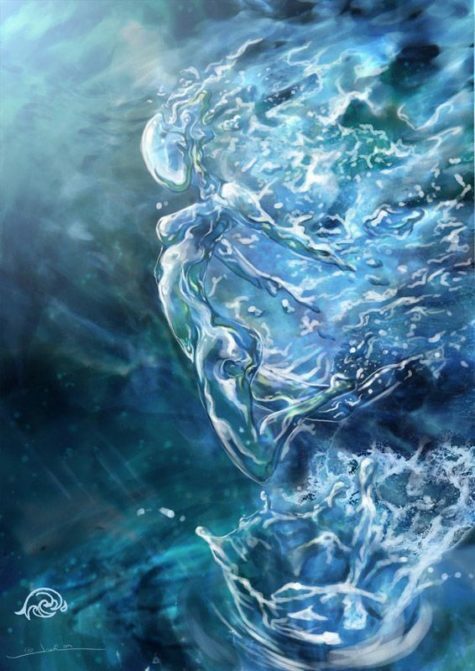 For them, there is no desire to go back into the waters of life (feminine), but they will do so if it is necessary. The legs of the fox are adapted for running. There is a tremendous stamina to them, an ability they can bring to others. 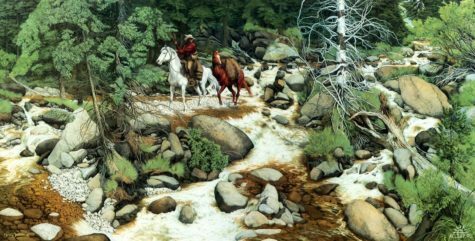 Their favorite gait is a trot, and it is believed that they can trot indefinitely without exhaustion or the appearance of such. Few animals of a similar size can outrun a fox. Learning to establish a trotting pace is essential to those with a fox totem for their overall health and success. The fox also runs in such a way that the tracks look like a single line of footprints. During the trot the feet are placed almost directly one in front of the other., This reflects a straight-forward expression of the feminine energy. Fox walks and runs on its toes, something very catlike. This is also significant for the fox is part of the canine family (dog), but it embodies a feline characteristic. The feline is the feminine energy given greater expression and movement. This quality reflects a need to assert the feminine, creative energies. The fox also has the ability to run up trees if it is necessary. 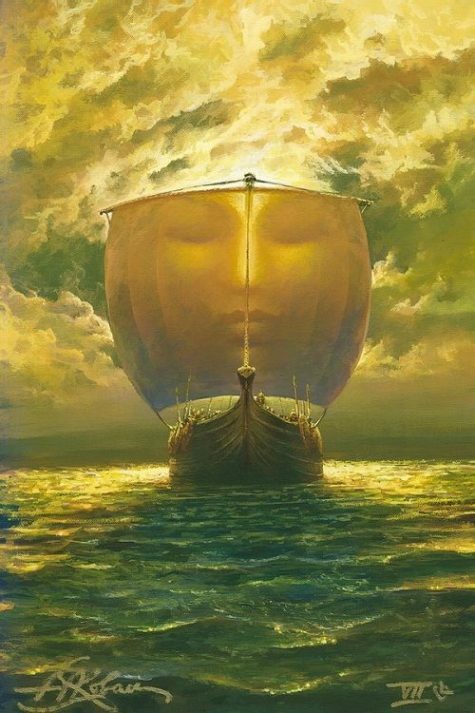 This reflects an ability to move into new dimensions and call upon new resources instinctively. The gray fox particularly has the ability to climb a tree much like a cat would, by using the claws of its back feet to push it up. The senses of the fox reveal much about the potential within those who have it as a totem. Its hearing is very acute. They are like mini-antennae. They can pick up the squeal of a mouse over a hundred and fifty yards away. Those with fox totems have an excellent ability to hear what is not being said, as well as any whispering that may be going on. 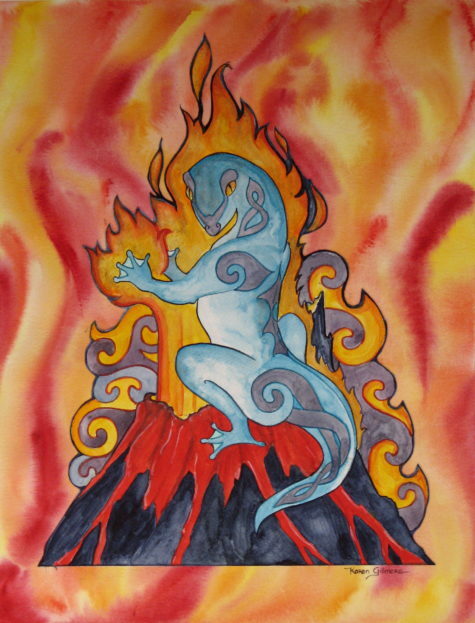 This ability is also tied to clairaudience, the ability to hear spirit. The fox also has excellent eyesight. In fact they have elliptical eyes, just like a cat. They are color blind, but they have a great ability to see varying shades of lightness and darkness. This gives an individual the ability to size people up very accurately. 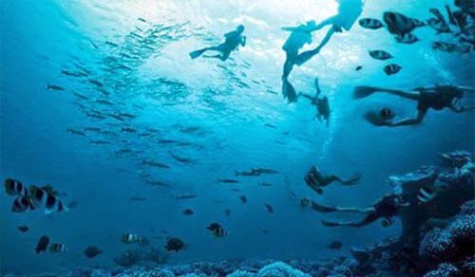 They also have a great ability to see moving objects, especially at the edges or borders of areas. 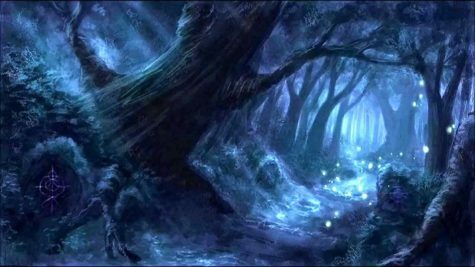 Because of this, it is not unusual for those with fox totems to develop the ability to see spirit; actually see those beings of the “Between Places,” the fairies and the elves. This will happen if fox has come to you. By far its keenest sense is the sense of smell. It hunts as much or more by smell as by the other senses. The fox is fascinated by unusual odors, and those with fox totems respond strongly to smells, detecting subtle differences in odors. Smell is one of its forms of social communication – deciding who to socialize with. It would be beneficial for anyone with fox medicine to study aromatherapy. Sexually, the sense of smell is one of their strongest stimulants, and it has a key impact on the degree and intensity of arousal for those with fox medicine. There is strong connection between fragrance and sexuality, and for those with fox medicine this is critical. 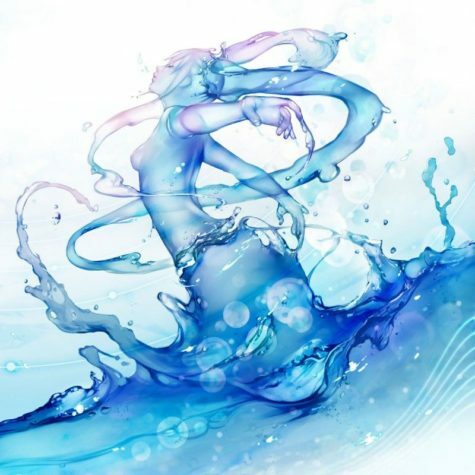 The sexual energy is our most creative energy; it is part of the kundalini energy force within the body. This force is critical in all activities. 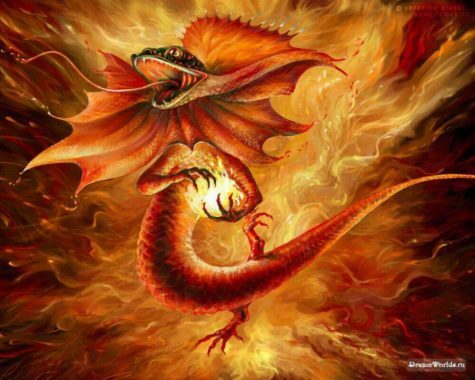 If controlled and channeled, it can be used for a variety of purposes – one of the most dynamic being for the art of shapeshifting. 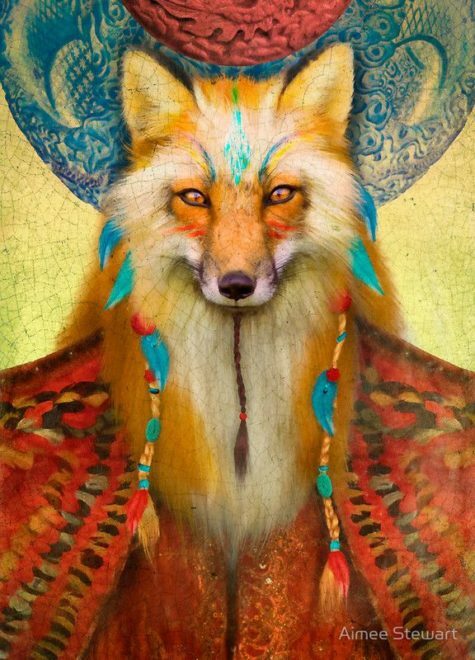 A fox entering one’s life as totem may reflect the awakening of the kundalini. Such an individual to whom fox comes often has a great capacity for sexual expression with an ability to practice it in rich and varied ways – often with little inhibition. 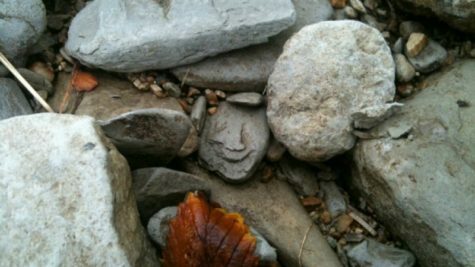 This aspect may often be camouflaged until the right moment. The sense of smell is also associated with higher forms of discrimination and discernment. One working with fox medicine should sniff out each situation. This will let them know who to avoid and who to connect with. Does this person smell right? Does something smell funny about this situation? Most foxes have only one partner. They are very monogamous. They also live alone for about five months of the year. They are often solitary and comfortable with that state most of the time. The red fox vixens (females) search for a den usually only when they are pregnant. 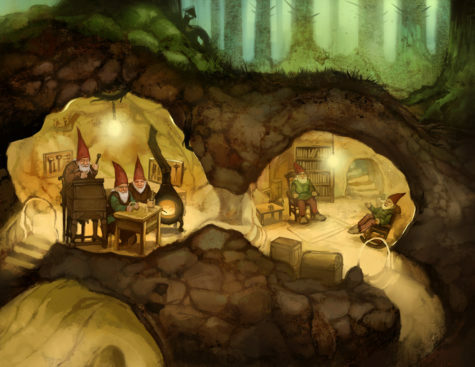 If possible they return to that same den year after year, adding to it and making it larger and more comfortable. This same quality and love of the home is found in those with fox totems. Although foxes are territorial and travel within that territory, they do return to their home, their den. Those with fox medicine may find themselves as territorial in their activities, but also inclined to return to their home and improve it. A litter of fox cubs usually numbers from one to six. They are blind and deaf when they are born, but they move from that extreme to one of great sight and great hearing as they get older. If the cub survives its first year it will usually live several more, establishing its own territory. This reflects that those with fox medicine may have their greatest tests in childhood, but also their greatest instinctual education in the art of survival. The name for the female Fox is Vixen. For humans, a vixen has always had the reputation of being a dangerous femme fatale. Having the ability to lure in males and send them away just as quickly, without a second thought, or lure them into danger. The reason for this association is that when the Vixen is ready to mate, she sends out a scent to lure her mate who is the same mate year after year. He then picks up her scent and faithfully returns to her. After mating, however, the female sends her mate away again, to raise her young on her own. She will beckon him again to return only when her kit has grown and left her side, and she is ready to mate yet once again. She is so irresistible that he returns year after year. The Vixen makes the rules of the relationship! The Vixen has a message for today’s women; know your worth, define your boundaries and the right man will find you irresistible! The fox is a survivor and a great hunter. In spite of encroachment on its territory and the history of being hunted it has been exposed to, it still manages to survive. Its instincts are great. Foxes are dainty, graceful, and lightfooted in hunting. They actually hunt more like a cat, often leaping upon their prey and holding it with their front paws. The fox is crafty and patient, and it will lie in camouflage intensely studying its prey until just the right moment to attack. Probably the fox’s cleverest hunting technique is “charming.” In this technique, the fox is seen near a prey, performing various antics. 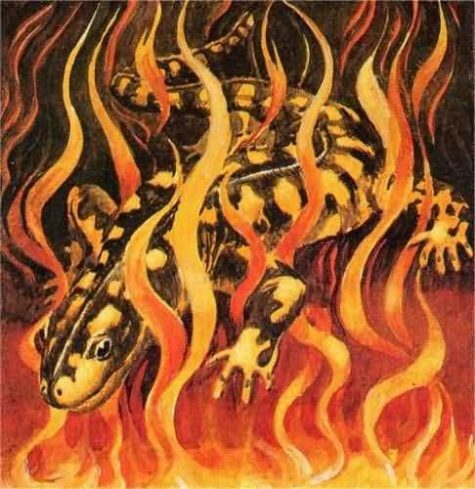 It will leap and jump and roll and chase itself, so that it charms the prey’s attention. While performing, the fox draws closer and closer without its prey realizing, as it is caught up in its seemingly non-threatening antics. Then at the right moment, the fox leaps and captures its prey. This is a camouflage technique, one associated with behavior. It is one that those with fox totems can use to capture any prize. 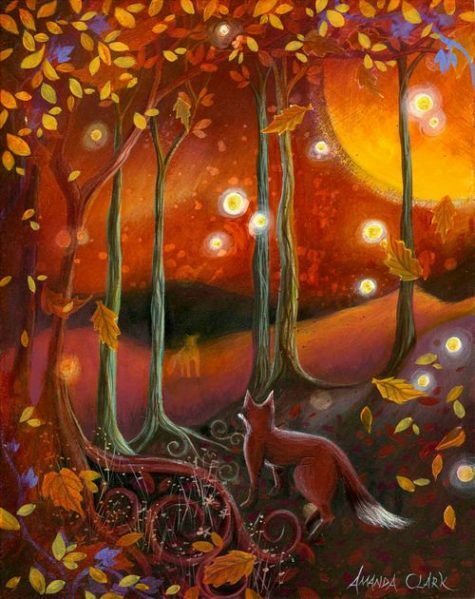 As you develop attunement to the fox and learn its magick, any prize can fall to you. 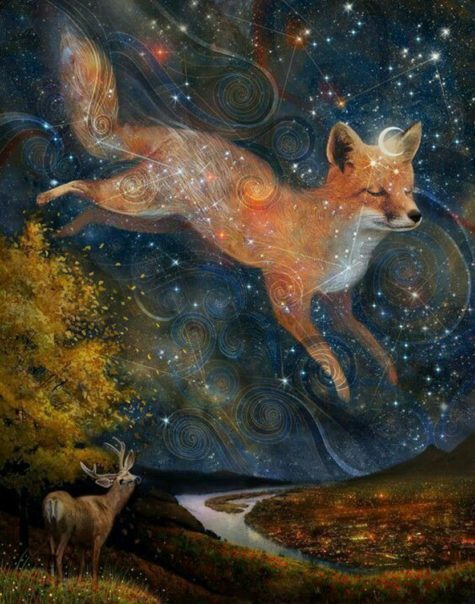 When Fox appears in your dreams, it may be telling you that there is a circumstance which calls for you to be very clever at this time, to look for new ways of approaching a situation or challenge. What areas of your life could use this kind of help? Fox can show you new ideas and new ways of doing things, sit in silence and let the fox show you. Fox could be showing up in your dreams to guide you to opportunity, an opportunity that could prove to feel serendipitous and lucky. A female Fox is like Wonder Woman! She could be telling you that you are more independent and resourceful than you realize, and she can show you how to tap into this aspect of her super powers. She is also saying that charm goes a very very long way in getting things to go in the most favorable and “luckiest” of ways! Foxes are also considered quite magickal in Japanese lore, so you may be dreaming of Fox because she wants to recommend adding some magick to what is needing your attention. Consider a ritual or crystals or anything that feels magickal to you. Country people have always admired foxes for their cleverness and courage even though they disliked them for their raids upon the poultry-yard. 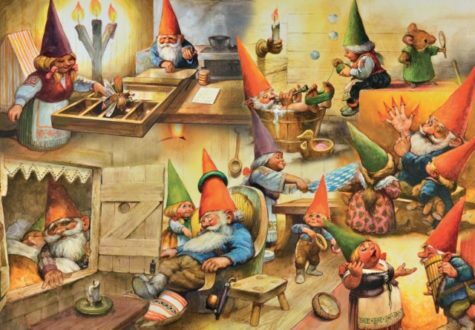 The folk tales of every country where they are found testify to this fact, from remote times down to our own. In some parts of Europe, a fox’s tongue was worn as an amulet to make the wearer bold; in others, the same effect was achieved by cooking and eating it. The fox was one of several creatures into which it was once believed that witches could, and did, turn themselves at will. In England, the witch-animal was more usually a hare, but there are a number of fox stories also. As late as the end of the 19th century, the people of Kirtlington, in Oxfordshire, spoke of a local woman who transformed herself thus. A fine fox was often seen near her house and was frequently hunted, though never with success. On one occasion, the hounds were so close behind it that escape seemed impossible, but the fox made a sudden turn and rushed into the witch’s house. 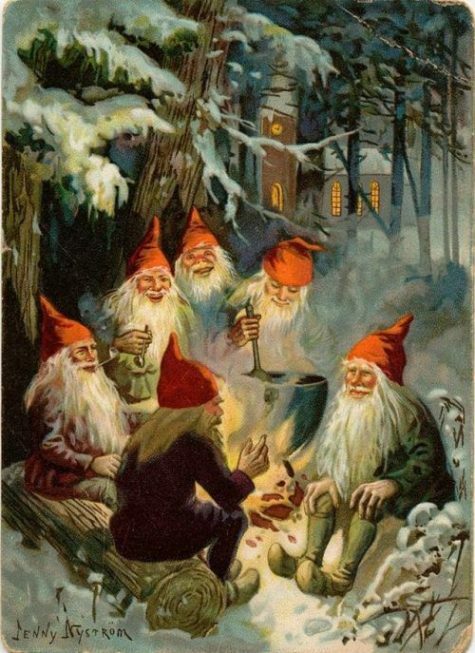 When, a few seconds later, the huntsmen followed it, there was nothing to be seen but a woman sitting quietly by her fireside. Certain families in Ireland were traditionally said to be descended from foxes, as others there, and in Scotland, were supposed to be descended from wolves or seals. Such fox-families were warned of a coming death by the appearance of many foxes around their house. It is perhaps because of this legend that in other parts of Britain a fox entering or coming close to a house is thought to be a death omen. Welsh people think it lucky to meet a single fox, but unlucky to see several together. A Lincolnshire belief recorded in “Folk-Lore concerning Lincolnshire” (1908) is that if anyone is bitten by a fox, he is marked for death within seven years. An old method of drawing out an obstinate thorn embedded in any part of the human body was to lay a fox’s tongue on it. This had to be done at night, just before going to bed. In the morning, the thorn would have come out, even though it had previously resisted every attempt to extract it by the use of poultices or other remedies. A cure for whooping-cough was to put down a dish of milk where a fox could drink it, and then to let the patient drink what was left when the fox had finished. In many parts of England, it is still firmly believed that foxes dispose of their fleas periodically by taking a piece of sheep’s wool in their mouths and wading with it into a pond or stream until only their noses are above water. 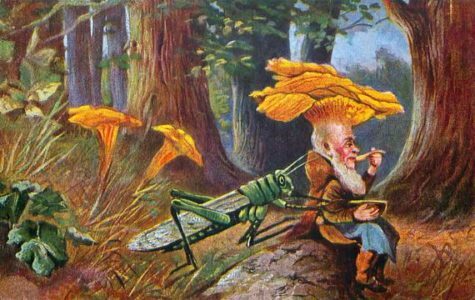 The fleas, to escape drowning, take refuge in the wool, and the fox then lets it fall into the water, thus ridding himself of these pests. 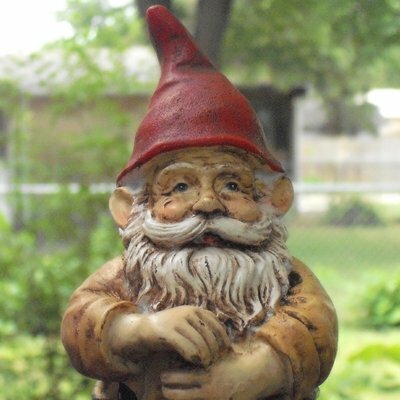 This curious piece of natural history is found in numerous districts, and many countrymen assert that it is quite true. In Oxfordshire recently, one man said that, because there are no sheep in this part of the country, the local foxes use bunches of dry grass instead of wool. He had, he said, “seen ’em at it, scores of times.” What exactly he, and other eye-witnesses have seen is not clear, but faith in this vulpine maneuver is still very common. Fox Spirits are not ordinary foxes. 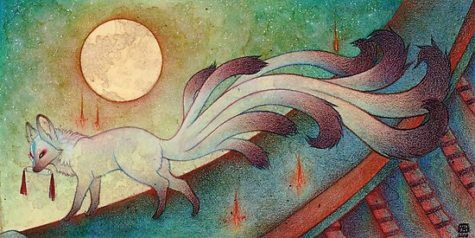 They are spirits whose true form is a fox shape in the same way that other spirits take the form of humans, cats, snakes, or birds, Fox Spirits may resemble ordinary foxes. The older a Fox Spirit gets, the more powerful it becomes. Age and power may be displayed by additional tails. The most powerful and ancient Fox Spirits are nine-tailed foxes. Theoretically, ordinary foxes can eventually evolve into Fox Spirits in the way that humans can evolve into spirits, too. Most Fox Spirits are shape-shifters; they can take many forms, including that of humans. Often they appear in the guise of seductive young women; however, any form is possible. 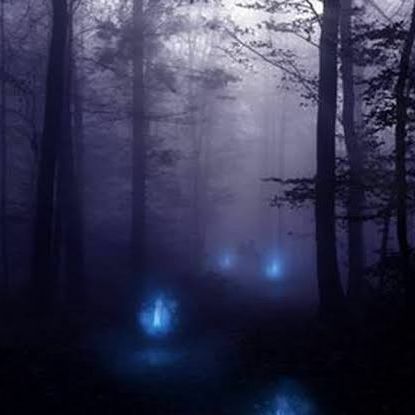 Fox Spirits can also shape-shift so that they appear identical to a specific person. Thus, someone may recognize a friend or relative at the door and open it, only to admit the Fox Spirit in disguise. Fox Spirits, seductive, sneaky, and often treacherous, are staples of modern manga, anime, and other forms of entertainment. Once upon a time, Fox Spirits were considered protectors, teachers, providers, and sponsors of the occult and alchemical arts. Even now, some Fox Spirits are saintly and helpful. The foxes that serve as Inari’s messengers are miracle workers, understood as sacred and godly. Among the functions of Chinese Fox Spirits is protection of archivists and librarians. If a book or document cannot be found, ask the Fox Spirits for help. Make an offering alongside the request. Offerings should be proportionate in size to the importance of the request. Then leave the room for a little while to give the spirit space and opportunity to work some magick. If the Fox Spirits have cooperated, whatever you’re looking for should stick out or somehow draw your attention itself. Fox Spirits may once have been a feature of pre-Buddhist East Asian shamanic religion. Fox Spirits tend to be sexually assertive, female spirits. As centuries passed and, society became more conservative, women were expected to be modest and subservient. Fox Spirits developed a bad reputation and became feared, especially in Japan and Korea. In China, their reputation is somewhat milder, although some sexual associations exist. Fox Spirits cause illness and misfortune. 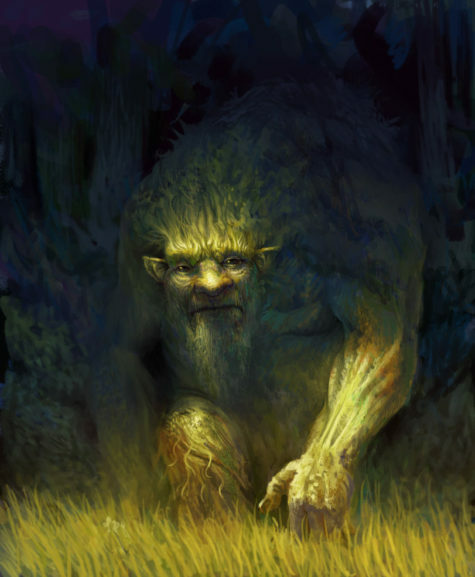 They possess victims, similar to possession by demons or dybbuks. Hearing voices where none should be heard. Insatiable and indiscriminate appetite. The person may eat anything, even food they wouldn’t normally eat; even things humans wouldn’t normally eat. Nocturnal sensations of suffocation and paralysis. Increasing facial resemblance to a fox. Sometimes the person develops a visible foxy snout. 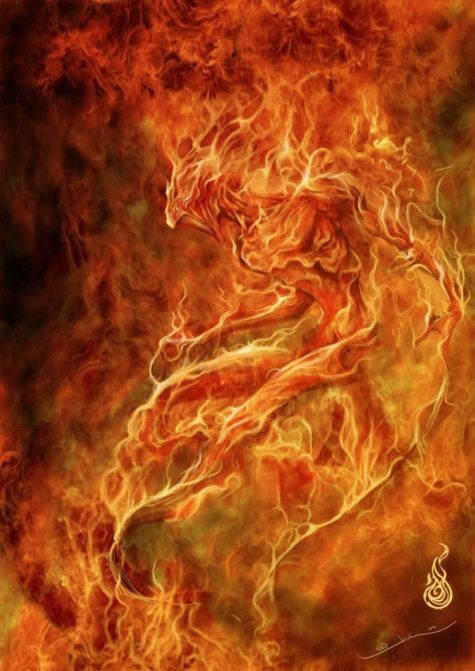 Eventually the Fox Spirit may push the true individual out, taking over body, mind, soul, and personality – either full time, or just intermittently. The Fox Spirit speaks through the person’s mouth, often indulging in obscenities, frequently sexual, which the person would normally never use. 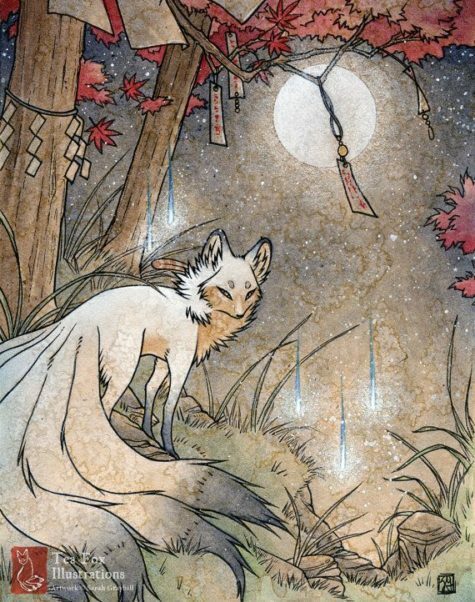 Although most Fox Spirits are perceived as greedy or power hungry, spiritual motivation may exist, as well; what the Fox Spirit may really desire is a shrine and daily offerings. The only way for them to make their desire known is through a human mouth, similar to African Zar spirits. Sometimes this is enough to satisfy them and the Fox Spirit evolves into an ally rather than an enemy. Fox Spirits’ very favorite food of all is inarizushi: fried tofu bags (aburaage) filled with sushi rice; however, you can negotiate their actual diet. Feed daily. Foxes get hungry. Fox Spirits provide for their devotees, although it’s generally believed they do this by redistributing wealth. Just like real foxes are believed to raid chicken coops, so Fox Spirits are believed to rob the neighborhood. What they provide for their devotees rightfully belongs to others, but has been stolen. Very ancient Fox Spirits, however, may have developed the alchemical and magickal skills to actually produce wealth, no stealing required. Fox Spirits can be exorcised by knowledgeable shamans; however, gifted exorcists tend to be tainted by their very success. Extortion rackets are suspected: the exorcist who specializes in Fox Spirit removal may actually be in cahoots with the Fox Spirit, who may be his servant. No wonder he can exorcise the spirit: the Fox is his familiar who always does his bidding. Independent practitioners are particularly suspect. Exorcisms may also be successfully performed at Inari shrines. 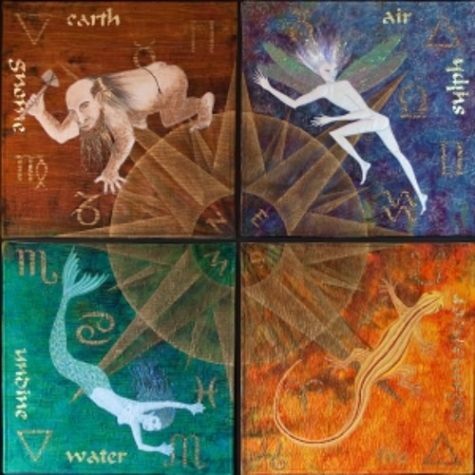 Fox Spirits are also attached to specific families and individuals, whom they may serve in exchange for care, feeding, protection, and veneration, or perhaps because they are ancestral spirits. Fox Spirits run in families. Families who are hereditary owners of foxes typically transmit this hereditary power through the female line. Association with Fox Spirits may indicate vestigal memories of ancient fox-oriented shamanic religion. For centuries tremendous fear and social stigma have been attached to families rumored to be Fox Spirit owners. In Tokushima, the Kitsune no Yomeiri is a less happy occasion. 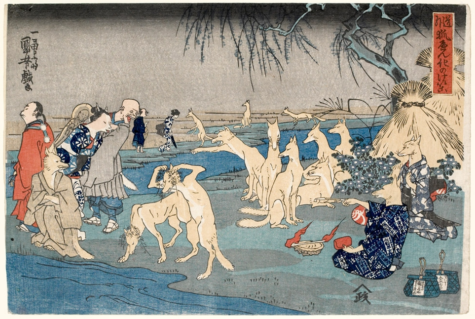 It was called the Kitsune no Soshiki (Fox Funeral) and seeing one is considered an omen of death. From Sakurai city in Ibaraki prefecture to Kashihara city in Nara prefecture, tales of Kitsune no Yomeiri appear all over Japan— with the sole exception of the northern island of Hokkaido. Most stories follow similar patterns with only slight variations. 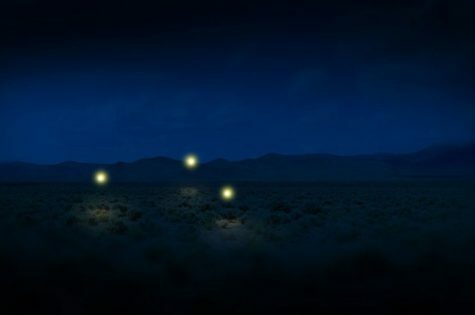 There are two phenomena referred to as Kitsune no Yomeiri—the bizarre weather called sunshowers where rain falls in broad daylight; and the procession of foxfire, called kitsune-bi, winding through the mountains late at night. The procession of lights became associated with weddings as it mirrored Japanese wedding ceremonies at the time. Based on traditions established during the Muromachi period (1392–1573), weddings were held at night and the bride was escorted over to her new home by a lamplight parade. This type of ceremony—called the Konrei Gyoretsu (Wedding Procession) —lasted until the mid-Showa period when Western wedding ceremonies replaced traditional Japanese ceremonies. 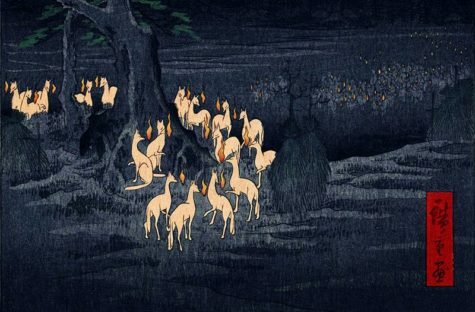 In both Niigata and Nara prefectures, Kitsune no Yomeiri was thought to be a good omen for the harvest, with the more lanterns being seen the more fruitful the harvest. A year with no fox weddings made people dread the upcoming famine. The foxfire procession kind of Kitsune no Yomeiri are rarely seen today. This is most likely due to the 1950’s deforestation of Japan’s native forests and replanting with fast-growing industrial cedar. Whatever magic of the forests that produced the foxfire lights, it is now gone, sacrificed to industry. 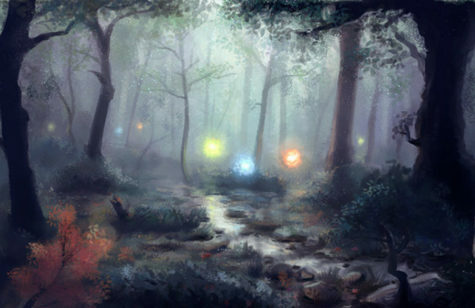 Another strange natural phenomenon goes by the name of Kitsune no Yomeiri, and in the modern era is much better known. On days when the sun shines and it still rains—a weather condition called tenkiame in Japanese or sunshowers in English—foxes are once again thought to hold their wedding ceremonies. How sunshowers became associated with fox weddings is vague. Some say that it has to do with mountains where foxes are mostly found. 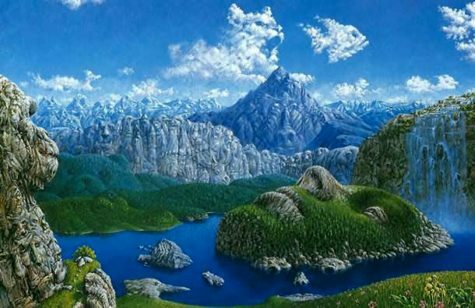 There are times when mountains are covered in rain, while the town below is clear. People said that the foxes summoned the rain with their magic to hide their wedding ceremony. 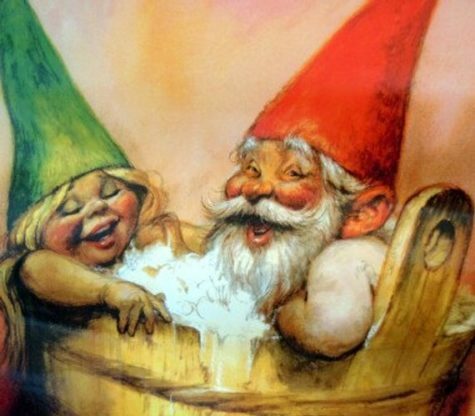 Others just think that because sunshowers are a mysterious occurrence, going against the natural pattern of clouds and rain, that people assumed a supernatural origin and associated it with foxes. As always, there are regional variations. In agricultural regions the sunshower version of Kitsune no Yomeiri was a good omen, promising rain for the crops and many children for the any new brides lucky enough to be married on such a day. In Tokushima, sunshowers are known as Kitsuneame (fox rain) and not associated with weddings. In Kumamoto prefecture fox weddings are associated with rainbows, and in Aichi prefecture they are associated with hail. Not all are modern tourist traps, however. The Yokaichi city, Mie prefecture Kitsune no Yomeiri procession to Suzakiha Mamiyashimei Shrine dates back to the Edo period, and is a ritual to drive out evil spirits and ask for blessings for the harvest. 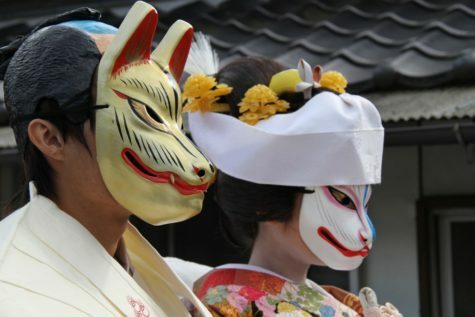 The festival in Kudamatsu city, Yamaguchi prefecture, has also been held since ancient times, although it bears little relationship to popular images of the Kitsune no Yomeiri. It involves asking the blessing of a pair of white fox deities whose wedding ceremony is re-enacted every year on November 3rd. 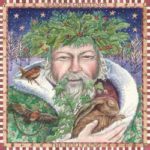 More about this festival can be found at The Pagan Calendar.